And just like that, the sun set on the 2018 season. Most (but not all!) Ocracoke businesses have closed up shop. Some intrepid souls stay open all winter -- check out our updated list of Who's Open for off-season eating, drinking, playing, and staying. ???? It's a rainy day. Read a book! ???? It's a sunny day. Go to the beach! 4pm: Go Dolphins! The first middle school home basketball games of the season begin at 4pm in the Tank (Ocracoke School gym). Fear the Pod! 6pm: Ocracoke Civic Affairs meeting @ the Community Center. Topics to be discussed include: OVFD update, County Commissioner/Hyde County update, NPS update, Mosquito Control Board update, and county technology update from Hyde County PIO Donnie Shumate. All are welcome to this fun and fascinating evening! It's beginning to look a lot like Christmas..... trees will arrive at the Variety Store today! Claim yours; they go fast! 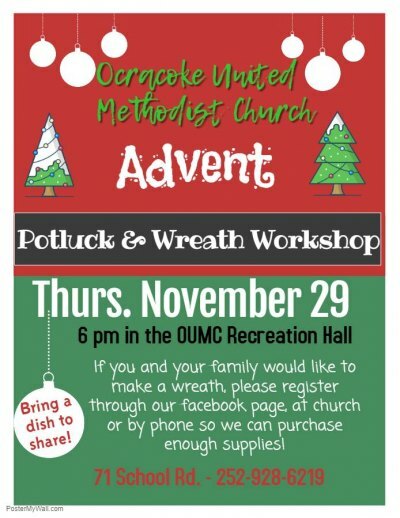 6pm: Family Potluck & Advent Wreath Workshop @ OUMC Rec Hall. Actually, it's beginning to look a lot like Advent, which, as Pastor Richard will tell you, is its own complete season worthy of recognition. All are welcome to join the potluck (please bring a dish to share) and the wreath-making. The church will provide all the supplies – fresh greenery, candles, etc. – for families to create and take home an Advent wreath of their own to light each week before Christmas. Not sure what an Advent wreath is or why you need one? Come and find out! 6pm: Kids' Movie Night @ Ocracoke Library. FREE; snack provided; bring a pillow or blanket to get comfy on the floor. Little kids (under 6) should also bring a grown-up or big sibling. The movie is "Sherlock Gnomes" -- the sequel to "Gnomeo & Juliet"! 6:30pm: Live Music! Martin & Friends @ Ocracoke Oyster Co.
Services @ both churches: Ocracoke United Methodist (Sunday School 10am; service at 11am) and Ocracoke Assembly of God (Sunday School 10am, services at 11am and 6pm; also Wednesday night service at 7pm). Both churches are now preparing for their Christmas pageant during Sunday School. The Assembly of God will hold a special Christmas Worship Service/Children's Program with food and fellowship following at 6pm on Sunday, December 16th. OUMC's Christmas Eve service (7pm) will be led by the youth and feature a Children's Nativity Pageant. Children who would like to participate are welcome to join in at either church! Christmas is coming! Remember to check our Community Calendar page to find out all about the island celebrations. Good times ahead! Get creative! The 6th Annual "Ocracoke Through Your Eyes" show will feature small works by local artists – maybe you! Stop by the Museum, pick up a canvas, and be a part of the show! Or call the museum at 252-928-7375 and they will mail you one! The canvasses are due back to the museum by January 10th. A wine-and-cheese reception and art opening/silent auction is planned for Saturday, January 26th, from 5 – 7pm at the Museum. OPS has started a new facebook album where they will post photos of the art and information about bidding from off the island. Check out the Ocracoke Current calendar for more events and information! We post daily updates on Facebook, too! Beginning this week, we'll post our Who's Open page to keep you up to date on where to sleep, eat, shop, and play during the fall and winter. Send info about any events we may have missed to ocracokecurrent@gmail.com. This story will be updated as needed with more information, so check back!